I remember as a child going to visit relatives in the community where my grandmother was born. Typically, we would go on Decoration Day, a day set aside to visit the community cemetery and honor deceased relatives by placing flowers on their tombstones. This special Sunday also included a dinner on the ground. Now in case you non-Southerners don’t know what a dinner on the ground is, let me explain. First, it really isn’t dinner according to your definition and it isn’t on the ground. (Dinner in my southern hometown was the midday meal and supper was served at night). A dinner on the ground is actually a potluck lunch held after Sunday services. At these feasts, folding tables on the church grounds would groan under the weight of a smorgasbord of southern delicacies. Dishes of fried chicken, green beans, creamed corn, field peas, fried okra, barbecue pork, and a multitude of desserts would fill the tables to capacity. Now southern cooks from those days didn’t stop by Kroger to pick up a cold cuts platter or some fried chicken. They would be up at the crack of dawn making something delicious from scratch before Sunday School. There was a good deal of pride that these women felt in presenting their best dishes. Two classic southern foods, deviled eggs and pimento cheese, always made an appearance at every covered dish meal that I attended. 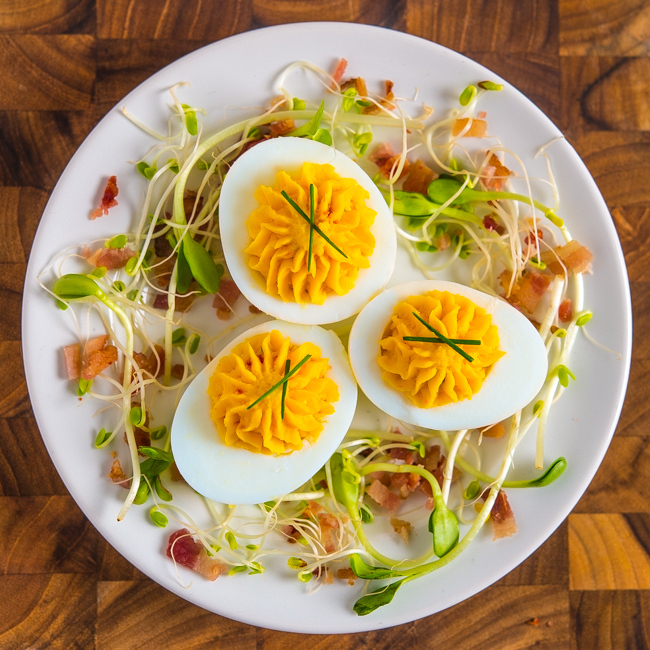 For this post, I decided to try combining the two to create Pimento Cheese Deviled Eggs. For good measure, I added some bacon. I’ve featured pimento cheese in a previous post. For this recipe, I halved the amount from that post and you will still have some pimento cheese left over. I figure that if you’re going to the trouble to make it, you’ll want some to spread on crackers for snacks. This delicious southern version of deviled eggs makes a great contribution to your next potluck meal. 1. Combine cheddar cheese, goat cheese, cream cheese, mayonnaise, mustard, onion, salt, sugar, chives, Tabasco, and pimento peppers in a medium bowl. Using a fork, combine ingredients well. 2. Carefully place eggs in a medium large pot covered with cold water. Bring water to a boil, turn off heat, cover pot, and let sit for 18 minutes. 3. Drain water and replace with cold water. When eggs are cool, peel and cut in half lengthwise. Remove yolks and place in a medium bowl. Add 2 tablespoons mayonnaise and combine well with a fork. Add 1 cup of prepared pimento cheese to yokes and continue mixing. A potato masher works well to get a smooth consistency for the filling, particularly if you want to use a pastry bag to pipe the filling in the egg whites. 4. Fill each egg white with cheese filling by piping with a pastry bag or with a spoon and garnish with bacon and two 1/2 inch pieces of chives. I knew you were a southern boy at heart! Oh my, bacon, cheese and deviled eggs! It has to be everyone’s dream. Pinning! Also, your picture and presentation is stunningly beautiful. I am drooling just by looking at the pictue. Oh I love a Potluck (Potgut-Luck) – always head right for those deviled eggs and fried chicken! I notice at work, everyone goes to Costco now – so very disappointing. Perhaps I need to move down South? Dinner on the ground is a new term to me — I like it! Pimento cheese certainly isn’t new — I love the stuff. I’ve even made deviled eggs with it. But not with bacon! I’m so going to steal that idea. Thanks. Oh Yes – Deviled eggs could always be found at any potluck in the south that I grew up in! 🙂 Yours look quite delicious Bill and as all of your food – quite beautiful! Perfect!! Great combination of flavors….thanks for sharing.